Please refer to the ' Contact Us ' section for methods of payment and postal details. Thank you. Paypal: If you wish to use Paypal please add 4% to the item price. Please note that all pairs of shoulder straps are original pairs not '' so called matched pairs'' unless otherwise stated. A.Es. 148. SAXON GARDE REITER REGIMENT OR'S SINGLE SHOULDER STRAP. Coppered metal tops of the shorter late 1912 pattern ..Tarnished finish very good condition . Mid blue backing no moth complete with its metal strap holder Overall very good condition. A.Es. 150. SAXON GARDE REITER REGIMENT HEAVY CAVALRY HAUPTMANN.S SINGLE PARADE SHOULDER EPAULETTE. A.Es. 151. SAXON GARDE REITER REGIMENT HEAVY CAVALRY OBERLEUTNANTS SINGLE PARADE SHOULDER EPAULETTE. A.Es. 152. SAXON GARDE REITER REGIMENT HEAVY CAVALRY OBERLEUTNANT OFFICERS SINGLE PARADE SHOULDER EPAULETTE. 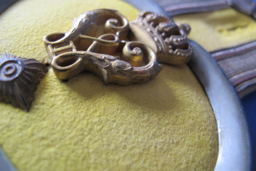 Oberleutnants Garde Reiter regiment single epaulette. Gilded metal epaulette, gilded tops with ornate scales and shell form end with single silver rank star . Padded Mid blue base The retaining hook is sadly missing.. In overall excellent condition. 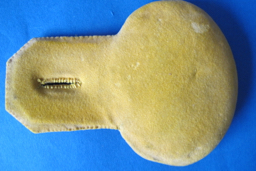 A rare strap in an the larger form of the early pattern. Super rare and a fine example of this rare regiment officers epaulette Outstanding!!!! Hello, Please refer to the ''Terms and Conditions'' section for methods of payment and postal details. Thank you. A.Es. 151. 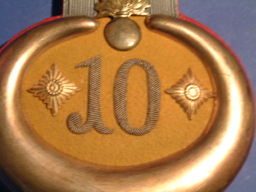 10th . 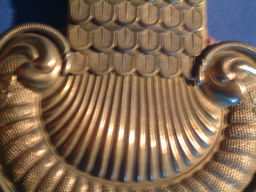 ARTILLERY REGIMENT HAUPTMANNS SINGLE PARADE EPAULETTE. 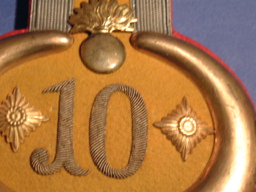 Part of the 6th Army Corps the 10th Artillery regiment was based in ( Breslau) Epaulette have yellow base with large silver wire embroidered,number 10 and a two gilt rank stars . Silver wire edge with black ( Prussian) stripes and gilded coppered half moon end. Bright Red bases No moth tracking or holes throughout. This regiment usually had white uppers but I am informed that the third (3rd) battalion only had yellow uppers. 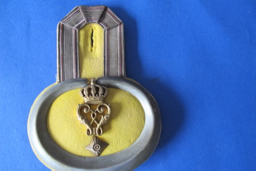 A very unusual Epaulette due to the wire numbers and its battalion status It is the only one I have ever seen. A very unusual piece in good condition. A.Es. 153 .... WURTTEMBERG ULAN 2nd WURTTEMBERG REGIMENT (No 20) ''KOENIG WILHELM 1''. 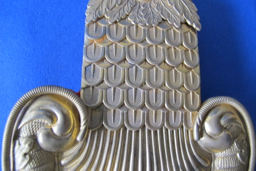 OFFICERS SINGLE EPAULETTE. A.Es. 154 .... WURTTEMBERG ULAN 2nd WURTTEMBERG REGIMENT (No 20) ''KOENIG WILHELM 1''. 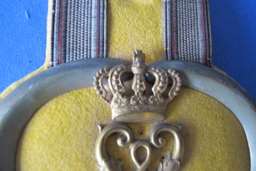 OFFICERS SINGLE EPAULETTE. AEs. 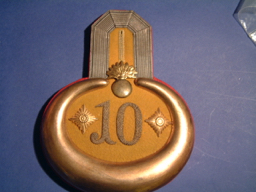 157 WURTTEMBERG 2nd ULAN REGIMENT (No 20) ''KONIG WILHELM 1st'' OP/ NCO's SINGLE EPAULETTE. 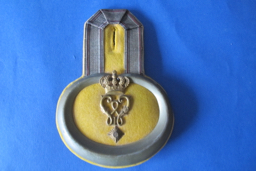 Silver metal half moon end Yellow felt base with the gilded Life regimental cypher for ''KOENIG WILHELM ' with gilded metal crown over .The epaulette are of good early heavy construction . Typical Ulan Silver metal piped straps with no moth marking at all !… Padded Yellow bases with some light wear . 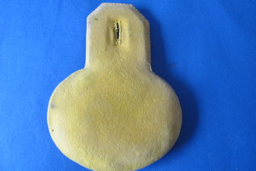 This is a rare strap with the original twisting hook for the Ulan Tschaspka helmet lines, they pass through the hook which twists and locks them in position…extremely rare I have seen very few of these devices) In over all very good condition. 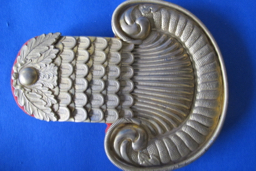 A good early example of a rare very desirable and ABSOLUTELY ORIGINAL ULAN NCO / OR/s epaulette.